Woodward columnar juniper is one of the most exciting new woody trees to come out of our program, maybe the most exciting ever! This beautiful upright columnar evergreen tree was found near Guernsey, Wyoming. In its early days, it was found to be difficult to propagate and so it never gained very much traction. We found it growing at the old Cheyenne Horticultural Field Station in Cheyenne, Wyoming 25 years ago and tinkered around with trying to unlock its rooting secrets. We finally cracked the code and it can now be rooted in sufficient numbers so gardeners everywhere can enjoy its attributes. Woodward columnar juniper is a selection of our native Rocky Mountain juniper. It can grow to be 20 feet tall but is very narrow, only 2 to 4 feet wide. It bears a great resemblance to the columnar Italian Cypress which never fails to make a lasting impression on those who visit the Tuscan countryside in Italy. 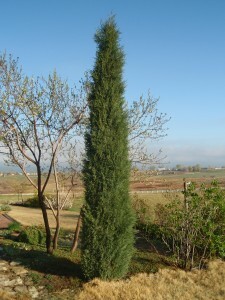 Woodward columnar juniper has attractive bluish needles year around, and once established it is a very xeric tree. It is a top choice as a tall evergreen screen where space is an issue and a narrow form is required. It has stood the test of time here in our climate and has proven to be remarkably free from limb damage after our frequent heavy snow loads. This distinctive tree is sure to be popular throughout most of the temperate parts of our country. The look of the Tuscan countryside could be yours. Gene Howard (the last Director of the High Plains Horticultural Research Station) told me that the Woodward was originally found up near Gurensey WY. Also the name “Central Great Plains USDA Horticulture Station” incorrect. It was actually called the Cheyenne Horticultural Field Station. Please correct this in your documents. Got it changed – thanks, Shane! I’ll check the manuscript for the book, too. Did Gene find it, or did someone else? Any chance you have a list of nurseries with this available? No luck at my favorites so far. The wholesalers sold out early this year, so not sure what garden centers might have gotten them. It was definitely a plant in high demand and short supply before the season even started! Try Fort Collins Nursery. Fort Collins Nursery told me today they sold out their entire stock of 100 Woodwards in early March. Fingers crossed for Fall availability. If you want some, get on the wait list. Just had a call from my local nursery and they just got 15 in for me. I have 5 acres so that not really a lot. Well, it’s a start. You can always substitute some of the other upright Juniperus scopulorum selections, they just won’t be as narrow. Glad you were able to get some, at least! I’ve seen the Woodward start off slowly for the first couple years after it’s been planted- 8-12 inches. As it approaches 4 foot tall and can start to grow quicker, closer to 18-24 inches per year. Lots of that depends on watering and sun exposure. How can I catch the Woodward juniper in terms of planting it? Do I just break a piece of it and plant it or do I have to get seeds or suckers? Junipers can be very difficult to propagate and Woodward Juniper is one of those. They are propagated by cuttings rooted into small containers then up shifted into larger containers. Even in the best conditions, several won’t root out. If you collect seed and get it to germinate, there is no guarantee that it will be a nice ,narrow, beautiful Woodward looking plant. Honestly, it’s much easier and quicker to enjoy these junipers by just purchasing one from a garden center.